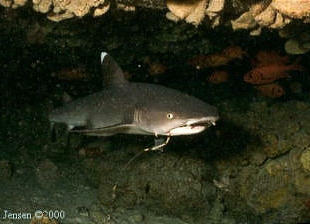 On my first boat dive the last thing I wanted to hear was, "Do you want to go see a shark in a cave?" Everyone else on the boat was enthusiastic so I kept my "Heck no!" to myself. I was totally relieved when the cave was empty. I began to dive several times a week and after about 10 more times of going to the cave to see the shark and the cave being empty, I really started wanting to see a shark. By the time I finally got to see a shark I had begun to play around with a Nikonos III underwater camera. I laugh to myself looking back at the first couple of rolls of film I shot because they all have the edge of my instructors shoulder in the fore ground. Sort of like, "Yeah, I'm right behind ya boss!" The little shark in most of the photos on this page was only about 4 feet long and for a few months could be found in the same cave nearly every time we dove that location. At some point we heard a diver had tried to clip and remove the hook from his mouth, but only succeeded in frightening the poor little guy and we never saw him again. 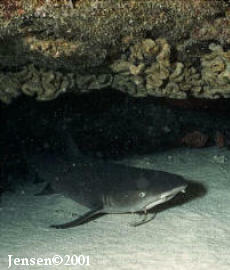 White tip reef sharks are generally harmless and don't normally approach humans. Accidents are known to have happened, but almost always because of harassment from divers and swimmers, or from divers spear fishing at night drawing them to the blood in the water during their feeding time. I asked some some free divers that go spear fishing at night if they had ever encountered problems with white tips or grey reef sharks. They told me they had never had a problem that wasn't quickly solved by "sharing" a fish or two from their catch. They also informed me that encounters with sharks at night usually occurred when they were spearing fish at depths of more than 40 feet of water. 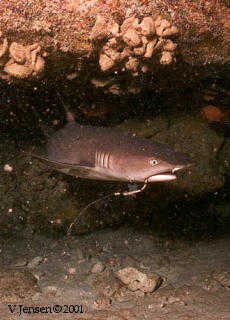 Whitetip reef sharks give birth to live little pups, usually one to five per litter. They average about a foot and a half to two feet long at birth. Both males and females reach sexual maturity when they are about 5 years old and a length of about 3� feet. The largest ones I've ever seen were 6 to 7 feet long. I've heard that's about as big as they get. They can live to be about 25 years old. 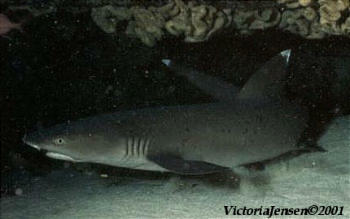 Although I couldn't resist using the little animation below, whitetip reef sharks rarely surface. 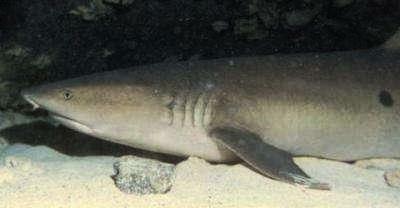 Whitetip Oceanics on the other hand, bare little resemblance to the reef shark except in name. They are quite aggressive creatures. 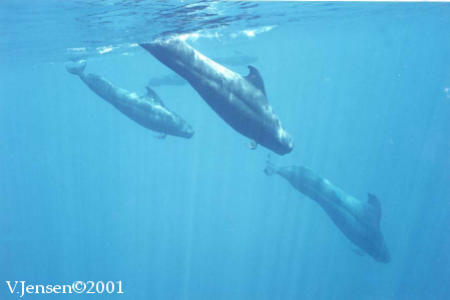 We would come upon them occasionally in the company of a pod of pilot whales a couple of miles off shore. They seem to hang around the whales hoping to scavenge some scraps of whatever they might be feeding on, usually deep sea octopus and squid. One particular day, after a 3 day storm, we went out for fun in search of whales with a couple other scuba instructors who were also experienced underwater videographers. We came upon a pod of pilot whales that seemed to be simply sunning themselves on the surface but they were accompanied by an Oceanic Whitetip. We wouldn't have allowed charters to get in the water under such circumstances, but the two videographers were insistent that because the whales weren't feeding it would be alright. With scuba gear on and video cameras in tow, they entered the water. As they began to swim away from the boat toward the whales they attracted the interest of the shark who was probably pretty bored with the whales. The shark began to head straight for the diver furthest from the boat, his dorsal fin cutting through the surface of the water in classic fashion. We shouted to him that he had company, but he ignored us and continued filming. The shark came within inches of him and then suddenly made a sharp right, and came toward the boat to check out the other diver. When the shark was within a few feet of him, the captain of the boat mentioned I might want to be ready to relieve the diver of his camera should he decide to "suddenly" come aboard. Just before the shark reached him, I swear he flew out of the water, camera, tank and all, past the swim step and onto the gunwale of the boat. We were dying with laughter. The shark continued to taunt the remaining diver with his charges and quick turns until we began to insist he return to the boat. He did get some nice footage, but there's only so far one should tempt fate. There were no sharks in the vicinity the day I took this picture, but a couple of these pilot whales had huge tentacles hanging out of their mouths. We were able to retrieve a piece of one of them dropped and found it amazing that each of the suction cups were lined with what appeared to be teeth. 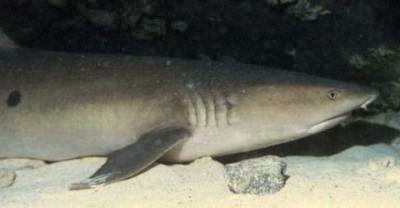 I had been diving 5 years before I got to see a Hammerhead. It felt very magical and I was so in awe that I began to swim slowly towards him. As he slowly disappeared into the distance I realized I had completely forgotten about my camera. It was 10 years before I got to see a Whale Shark. It seemed every time one was spotted it would be on my day off. Once there was one right off the end of the Kona pier in about 15 feet of water. A quite spectacular event for several of my friends and anyone else that happened to be on the pier that day! photo by: Quenton Dokken, Courtesy of The National Marine Fisheries Service and N.O.A.A. The day I finally got lucky, I was on a large boat with 15 other people, just outside the harbor of South Kohala, enjoying a surface interval after a deep dive. We had all been fortunate enough to get hired to do some U/W work for the FX crew making the movie, Waterworld. 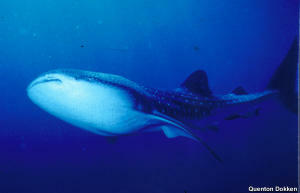 In spite of all the noise and commotion that had been going on that day, a baby whale shark appeared next to the boat. It was about 20 feet in length; as adults they get quite a bit larger. Everyone gently slipped into the water with snorkel gear, but after a minute or two he disappeared. To my delighted amazement he returned a few moments later. He stayed around for about twenty minutes slowly swimming to and fro, giving us a good look at him from every angle of his magnificent polka dotted body and great plankton syphoning mouth. for a shark box. See the treasure box link below.